The Rosary Bracelets shown below are now only available by custom order and must be requested by email prior to purchasing to ensure availability. All orders take 3 weeks to fill. These wooden, glass, and horn rosary bracelets can be made to your custom size. ​To find your size, measure your wrist and add one inch. Some customers fail to add one inch, making the bracelet too small: they are failing to keep in mind that the bead size reduce the inside circumference when the bracelet is wrapped around your wrist. When measuring the extended bracelet with a ruler, the bracelet is hung under its own weight; the length is measured from the base of the clasp, so that the clasp will not be included in the length. 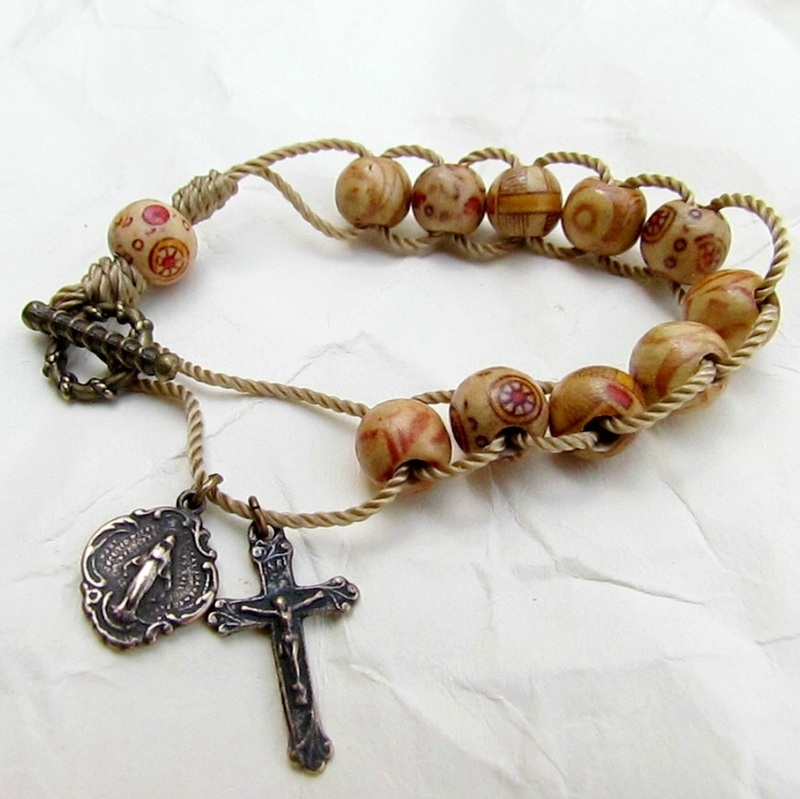 Here is my newest design of rosary bracelet - The Macrame Rosary Bracelet! 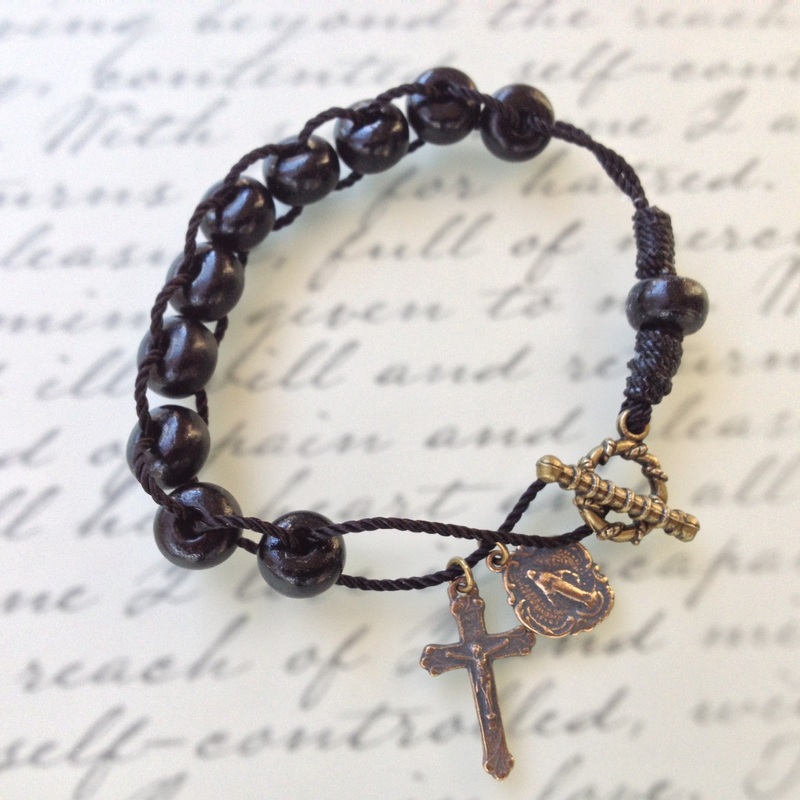 The bracelet has a sliding macrame clasp which allows the bracelet to fit almost any sized wrist. But there is more! This bracelet is very easy to take on and off even for those men who cannot fathom the intricacies of the lobster claw or the uncoordinated who cannot get the bar through the circuit of a toggle clasp, or even those with arthritic joints who just prefer not to fiddle with bracelet clasps. You simply slide your hand through the bracelet and pull the draw string until the fit is perfect for you! 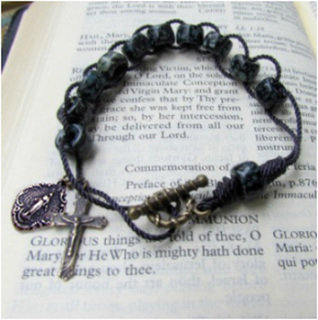 This rosary bracelet is made with 10 Horn beads for the Hail Mary beads that you can push along as you pray. They will stay in place. There is one Our Father bead. The Crucifix and Miraculous Medal are solid bronze. They are hand cast reproductions of antique medals. Each bead is smooth and glides easily along the cord. 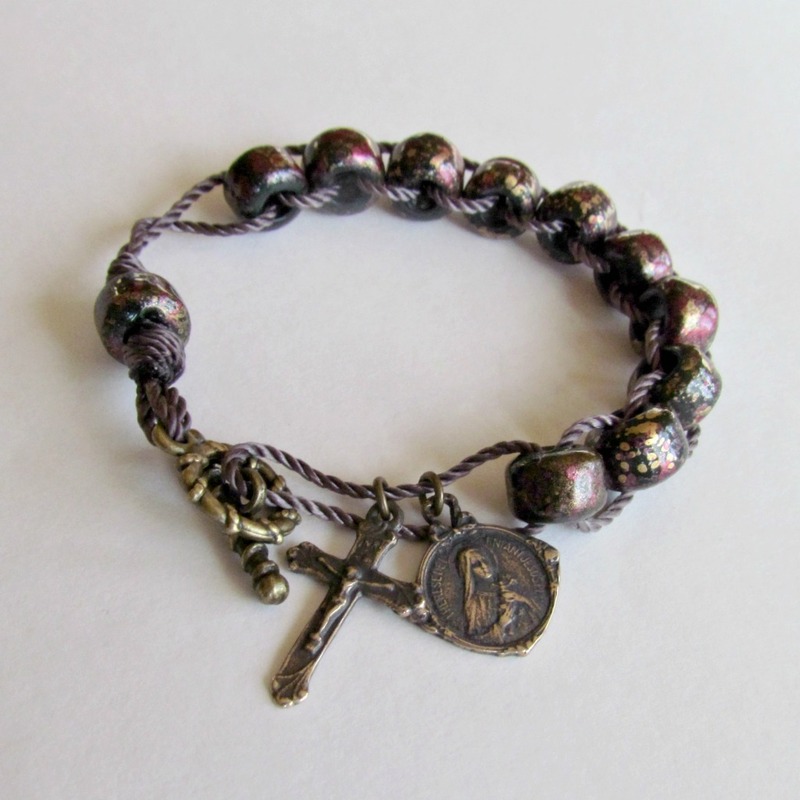 This rosary bracelet is made with 10 Horn beads for the Hail Mary beads that you can push along as you pray. They will stay in place. There is one Our Father bead and a toggle clasp. The Crucifix and Miraculous Medal are solid bronze. They are hand cast reproductions of antique medals. Each bead is smooth and glides easily along the cord. The average bracelet measures 8" long, but I make them is a variety of lengths. To find your size, measure your wrist and add 1 inch. Contact me if you need a different size than 8" long. Each bead is hand sanded so it can accommodate the double chord. The bracelet measures 7 1/2" long. (The average woman's size). But it can be made to most any length. To find your size, measure your wrist and add 1 inch. Contact me if you need a different size than 7.5" long. Available in sizes 6.5" and 7 inch. Custom made upon order. Allow 3-5 days for production. The bracelet measures 8" long. (The average man's size). But it can be made to most any length. To find your size, measure your wrist and add 1 inch. Contact me if you need a different size than 8" long. Sorry this bracelet is sold out. Only one item left! 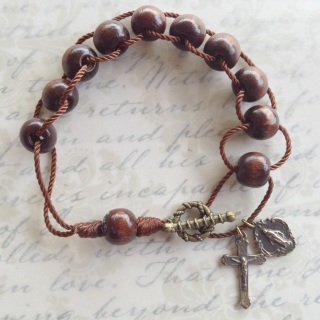 This rosary bracelet is made with 10 Littleleaf Boxwood Hail Mary beads that you can push along as you pray. They will stay in place. 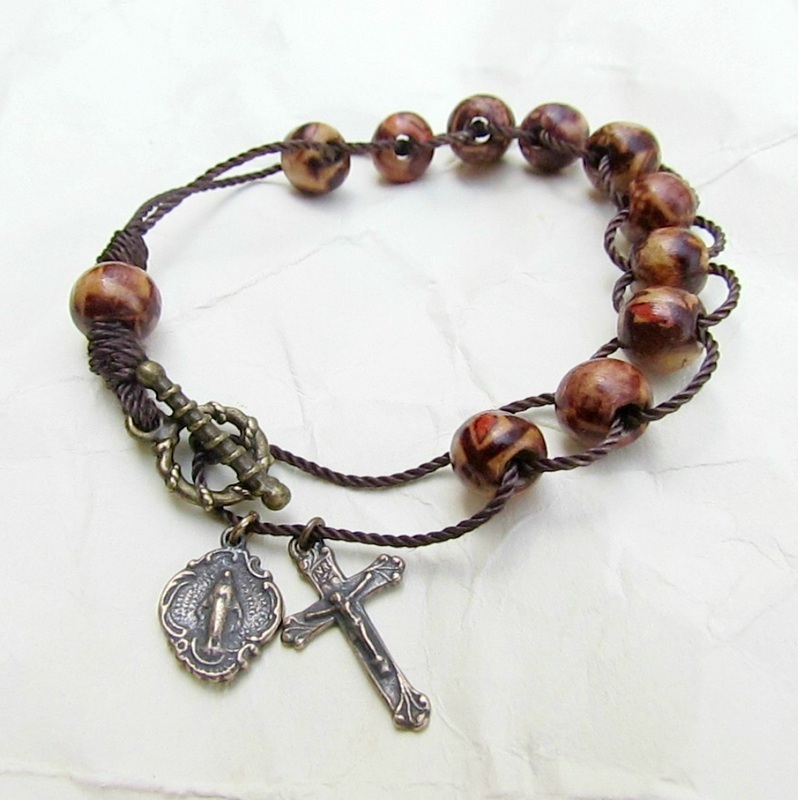 There is one Our Father bead and a toggle clasp. 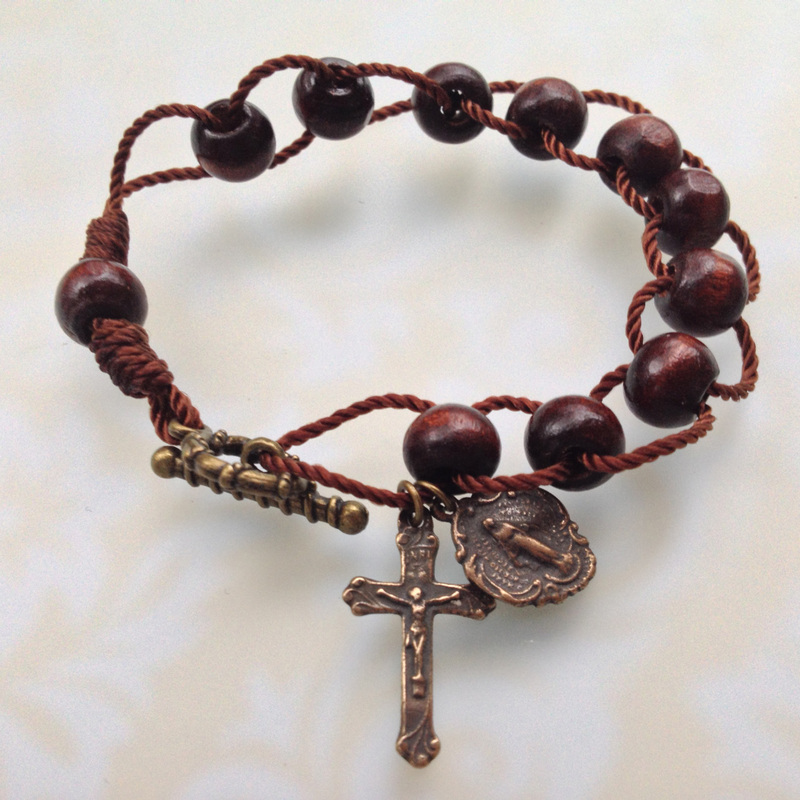 This is a new addition to my bracelets: a rosary bracelet with 10mm wood beads. As with my other wood and glass bead bracelets, it is made with 10 Hail Mary beads that you can push along as you pray. They will stay in place. There is one Our Father bead and a toggle clasp. Each bead is hand sanded so it will glide smoothly over the double chord without snagging. The Crucifix and Miraculous Medal are solid bronze, hand cast reproductions of antique medals. The average female takes a 7-1/2" bracelet, average male takes an 8" diameter wrist, but I make other sizes as well. To find your size, measure your wrist and add 1 inch. 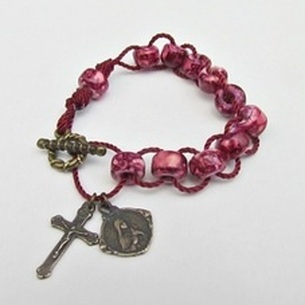 This bracelet is made with glass beads that are mottled with gold and burgundy. They are strung on double strands of cord so they will slide and stay in place as you count your prayers. It is secured with a toggle clasp. The medal and crucifix is an antique reproduction, solid bronze and beautifully detailed on both sides. You can select either the Miraculous Medal or the St. Therese medal shown in the photo. The average adult male takes a 8" size bracelet, while the average size for an adult female is 7-1/2", but I make other sizes as well. The bracelet comes in a number of sizes. Click on the button to see what sizes are available. (The average woman's size is 7-1/2", the average adult male is 8"). To find your size, measure your wrist and add 1 inch. This bracelet is made with glass beads that are mottled with dark navy and azure. 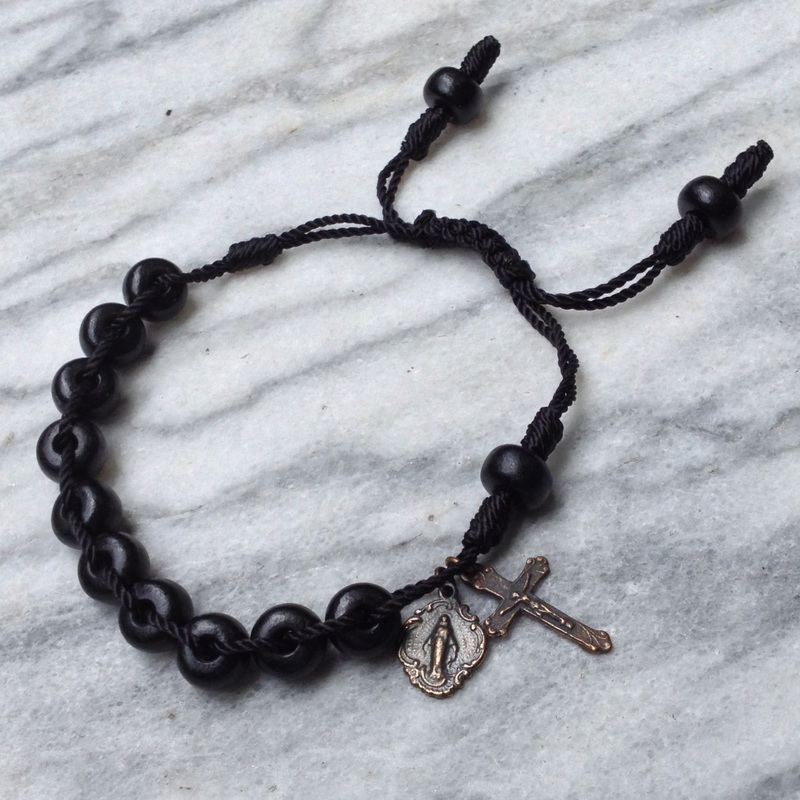 The beads are strung on double strands of navy cord so they will slide and stay in place as you count your prayers. It is secured with a toggle clasp. This bracelet has 10 Hail Marys and 5 Our Father beads. The beads move and stay in place for counting purposes. Medium size Length 7 1/2'. (Average woman's wrist) It can be made larger if needed. Just contact me the length you wish. Or choose a toggle clasp. This bracelet is designed for saying the Christmas Novena, also known as the St. Andrew's Chaplet. 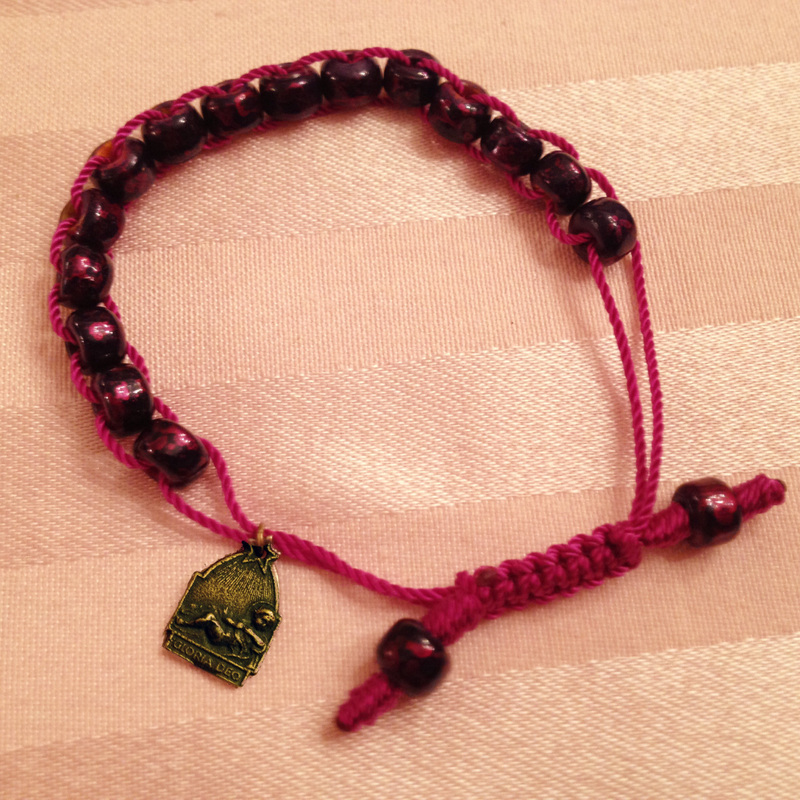 It is constructed to sturdy nylon cord and purple glass beads which slide along the cord. A solid bronze "Gloria Deo" (Glory to God) medal is attached, showing the Infant Jesus on one side and the Jerusalem Cross on the obverse side. There is no clasp on this bracelet -- the macrame closure allows the bracelet to adjust to most any size so that it can slide over the hand and be tightened to fit over any wrist to the comfort of the wearer. A Christmas Novena prayer card is included with each order. The St. Andrew's Advent Chaplet is said every day from the Feast of St. Andrew (November 30th) until Christmas Eve to prepare the soul for the Nativity of Our Lord. Each day, a specific prayer (see below) is said 15 times. It can be said in one sitting, but I like to say it once each hour, spreading it out over my day, to constantly bring my mind back to the mystery of Christmas. 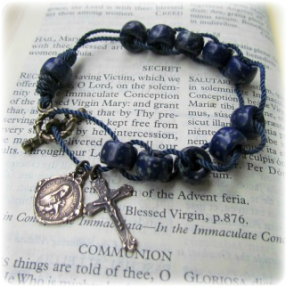 My chaplet bracelet with sliding beads allows one to easily keep track of the prayer. 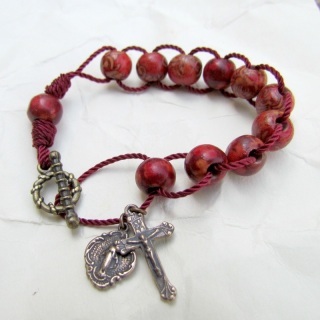 Each time the prayer is said, a bead is slid along the cord toward the medal of the Infant Jesus. and of His blessed Mother. 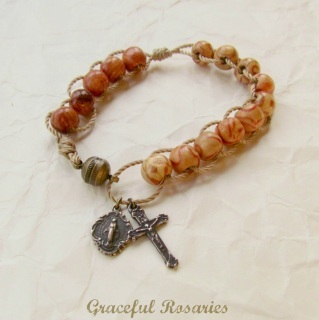 For more of my beautiful Rosary Bracelets made from Glass Crow Beads, click here: Sacrifice Bead Bracelets.